McHugh's, Molloys, O'Brien's. What do all of these bottle shops have in common? They all have their own label beers produced at Irish microbreweries for sale in their stores and they probably aren't the only ones. I wrote about the latest release from McHugh's recently and since then, I have been sent samples of beer from Molloys and O'Brien's to try. 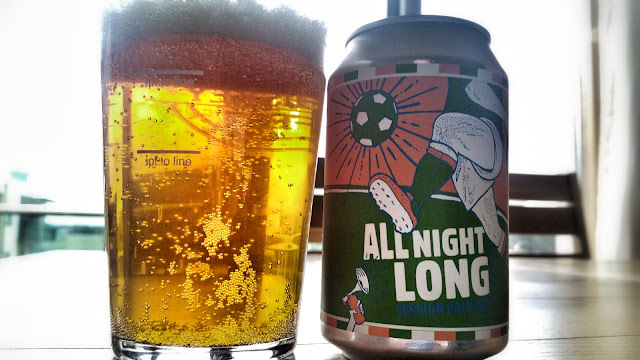 Technically it was Rascal's themselves who sent me some beer and one of them was a beer called All Night Long which is brewed for and sold exclusively in Molloys Liquor Stores. It was brewed in time for the Euros and is clearly branded for the event. So how's the beer? Well, it's a 4.2% session pale ale of which there's a plethora of these days so does this one stand up to scrutiny? I would have to say that yes, it does. Citrus and pine resin on the nose along with a hint of caramel and some orange pith. It tastes pretty much how it smells, there's a brief burst of tropical fruits in there too. It's a little on the thin side but with that said, a session beer tends to be a little thinner than most. There's a deep and lingering bitterness that's not sharp, just pervasive. I would have personally liked to have seen this beer a little under 4% to make it a little more sessionable but 4.2% is still pretty low. Is the beer a hit? I would say it probably is because I just checked out the Molloys website and it says out of stock at the moment. Hopefully we will see more from this beer as it's very enjoyable. Apparently, Molloys have a pub in Tallaght so there are a few kegs available if you are in the area. 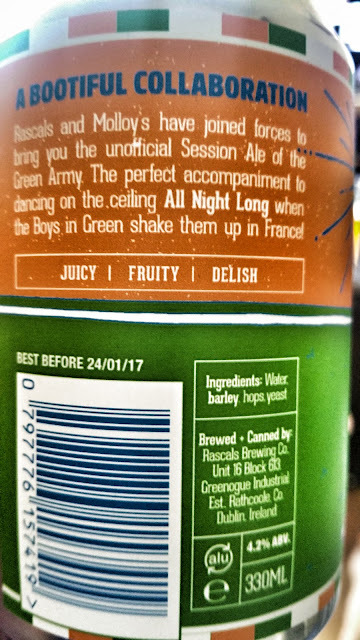 If you really want to know what's in it, Rascals kindly provided the full ingredients list. O'Brien's sent me some of their new collaboration. 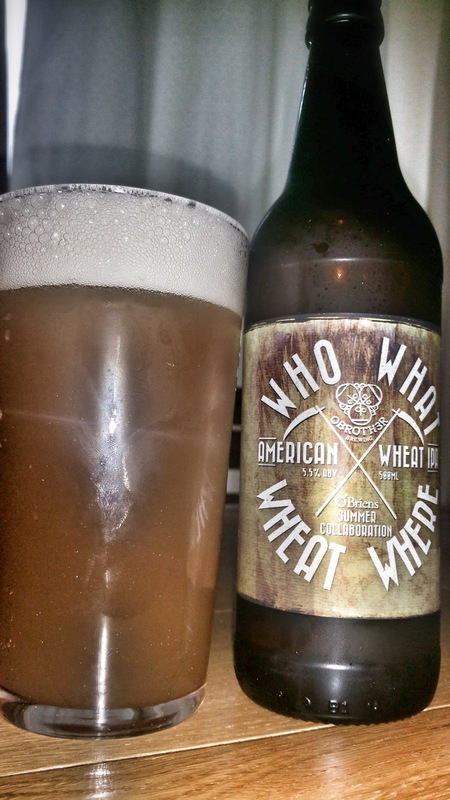 It's called Who What Wheat Where and it's a collaboration with O Brother out in Kilcoole which is better known as Glenroe to some people. They have gone with an American hop forward wheat ale here and the first thing you will notice on pouring is the colour and clarity. I don't usually care about how clear a beer is and clarity has little place in a wheat beer but in this case, it actually looks rather unappetising. The colour is a sort of murky brown that could easily be a pint of Liffey water. First thing to do, get over how it looks and move on. It's worth it because what you have is a hop forward beer with a big wheaty body and a plethora of hop aromas and flavours to enjoy. It's basically a wheat IPA. Resinous and bursting with citrus punch along with a slightly spicy note, it's the sort of beer I love despite its appearance. O'Brien's also provided the full ingredients list if you are interested, though no yeast was mentioned. Malts - Wheat made up 50% of the grist.